This fountain honors children’s book author Frances Eliza Hodgson Burnett. Friends of Burnett wanted to memorialize her after her death in 1924 with a storytelling area in Central Park. 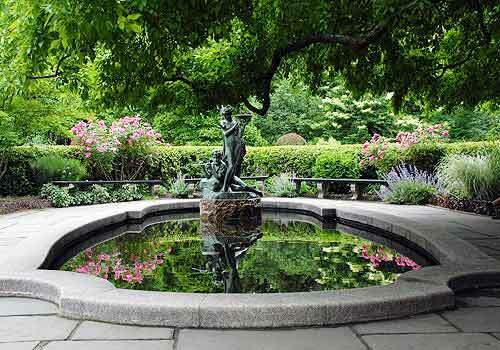 The Conservatory Garden, which reopened to the public in 1937, was chosen as the perfect site for the memorial. Some refer to the two figures, a reclining boy playing the flute and a young girl holding the bowl, as effigies of Mary and Dickon, the main characters in The Secret Garden. The bowl is a functioning birdbath where small birds drink during three seasons of the year. The sculpture stands on the edge of a small concrete pool that features a variety of water lilies. It was one of the earliest statues restored by Central Park Conservancy in the 1980s. In Conservatory Garden at 104th Street and Fifth Avenue. Main entrance at 105th Street and Fifth Avenue.